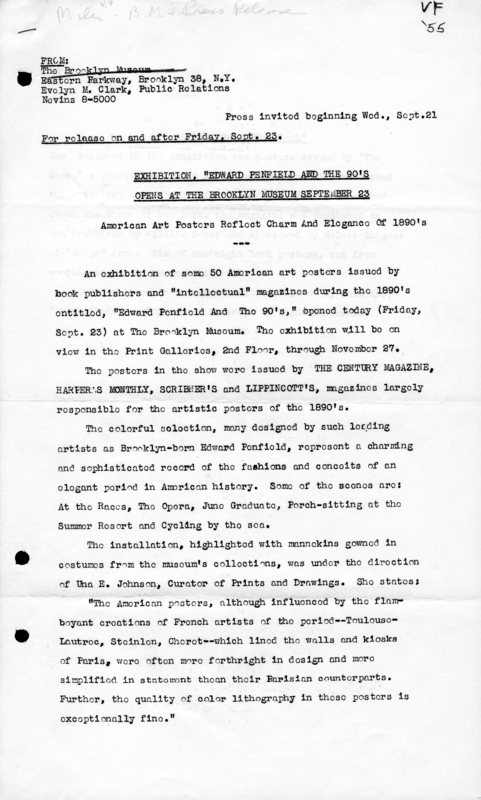 September 23, 1955 An exhibition of some 50 American art posters issued by book publishers and “intellectual” magazines during the 1890’s entitled, “Edward Penfield And The 90’s,” opened today (Friday, Sept. 23) at The Brooklyn Museum. The exhibition will be on view in the Print Galleries, 2nd Floor, through November 27. The posters in the show were issued by THE CENTURY MAGAZINE, HARPER'S MONTHLY, SCRIBNER’S and LIPPINCOTT’S, magazines largely responsible for the artistic posters of the 1890’s. The colorful selection, many designed by such leading artists as Brooklyn-born Edward Penfield, represent a charming and sophisticated record of the fashions and conceits of an elegant period in American history. Some of the scenes are: At the Races, The Opera, Juno Graduate, Porch-sitting at the Summer Resort and Cycling by the sea. Included in the exhibition are posters issued by “The Lark,” a short-lived avant garde publication which reflected the whimsical and thoughtful moods of the 1890’s. Centered about the theme of the lark, the magazine was published in San Francisco by William Doxey and sponsored by Gelett Burgess of "Goops" fame. Six of the eight Lark posters, cut from wooodblocks are in the exhibition. Other posters in the show include: “Clown” by Peixotto; “March Winds” and ”Midsummor Holiday” by Maxfield Parrish. Brooklyn Museum Archives. Records of the Department of Public Information. Press releases, 1953 - 1970. 1955, 013-14.